ONI Bureau: Prime Minister Narendra Modi while addressing a “Swabhiman Samavesh” of the BJP in Bolangir, paid tribute to Achyutananda Sahu, the Doordarshan cameraman who was martyred in Dantewada Naxal Attack in Chhattisgarh on October last year. 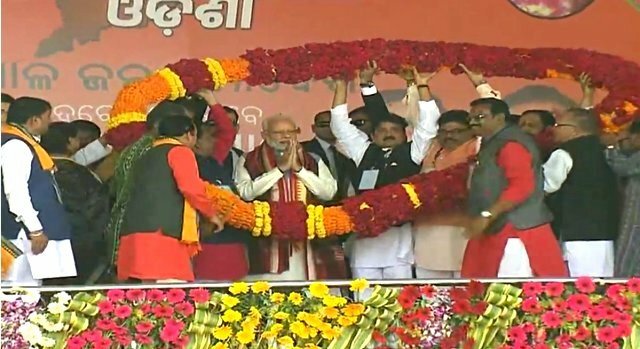 While addressing a public meeting at the Patharachepa Ground in Bolangir, Modi slammed the ruling BJD for not being able to spend the District Mineral Fund for the welfare of tribals. In his speech Modi said that Odisha has got more than Rs 4,000 crore in its District Mineral Fund. It will help in the development of the tribal areas where mining is carried out. But unfortunately, the state govt hasn’t been able to spend that money for the benefit of people. He further said that BJP led Central Government has cancelled around 6 crore fake ration cards, gas connections, and scholarships in last 4 years. However, all ration cards have been digitised and around 80% cards have been linked with Aadhaar. Expressing his satisfaction, Modi said in a month, more than Rs 20,000 crore of development projects have been either inaugurated or initiated in Odisha. “Projects worth more than Rs. 1,500 crore in sectors like education, connectivity, culture and tourism, that have been kick started today, will not only spur the growth of Odisha but also of eastern India”, Modi said.